LIVERPOOL LEGEND Ian Rush says that Daniel Sturridge could be the difference for the club in their push for the Premier League title. Jurgen Klopp’s men finished fourth last season, despite Philippe Coutinho and Sadio Mane being their top scorers in the league with a relatively paltry 13 goals each. If Sturridge can maintain his fitness after a period of injury trouble, however, the Anfield hero believes the England international can propel them to their first domestic crown since 1989-90. “With the way Liverpool play, they spread the goals around more but it would be great if we could get one player that guarantees you 20 or 25 goals a season — that could be a big difference,” he told the Irish Examiner. “You never know, if Sturridge gets himself fit and all that, he’s very gifted as a player and he’s capable of doing it. But then to get into Jurgen Klopp’s side you’ve got to be 100% committed to what he feels. 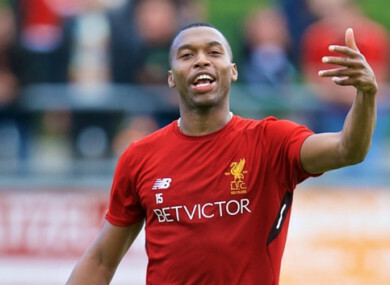 Sturridge limped off in Liverpool’s 3-0 friendly win over Bayern Munich in midweek with a thigh problem, but the Reds are confident it is not a serious issue. The cheque that bought Neymar for €222m? Email “Sturridge can fire Liverpool to Premier League title – Rush”. Feedback on “Sturridge can fire Liverpool to Premier League title – Rush”.